Unblocking a kitchen sink drain is one of the most common service calls plumbers make. Unlike tubs or showers, sinks cannot be snaked from above. 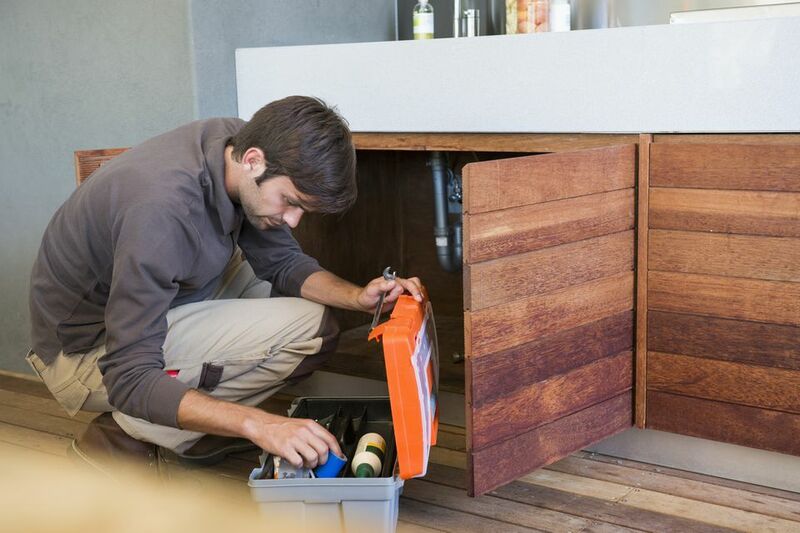 Sink openings are designed to prevent objects from getting into the pipes. Even if the cable fits, the drain traps will make it difficult to get the snake though. This project is of average difficulty and should take only 30 minutes to an hour. The first step to snaking will be to disconnect the p-trap from under the kitchen sink. The trap is held together by friction washers and slip nuts. Before loosening any of the nuts, place a small bucket or pan under the trap to catch the water that will be in it. If the trap is made of plastic then nuts will only be hand tighten and should come off easily. If the trap is chrome-plated then channel locks or a pipe wrench will be needed to loosen the nuts. With the trap disconnected, look into the pipe and see if you can see any obstructions. If it looks clean then the clog is further down the line. Pull 12 to 15 inches of cable out of the snake. Push the cable into the drain line. If you can not see into the T-fitting have someone listen in the wall while you crank the handle. They will be able to hear it if it is going up the vent. If it is going up (into the vent) pull a little out and reinsert the cable so it is going down at the T-fitting. If you feel no resistance keep pulling out more cable and feeding it in until you do. When you hit the clog, tighten the set screw at the front of the snake. Next, push the cable forward while cranking the handle clockwise. When you run out of cable loosen the set screw and pull another 12 to 15 inches out. Reset the screw and continue steadily cranking clockwise. Continue this process until you have broken up the clog or reached a larger diameter pipe, like the main stack. You will know that the clog is cleared when you no longer feel any resistance on the cable. In cases where you push the clog into a larger pipe, you will be able to feel the cable moving freely around. If you hit a really rough spot, a push and pull method should be used. It is done by feeding the cable in about 3 feet and then pulling it back 2 feet. Then, feed the cable back in 4 feet and pulling out 2. Continue this process until you feel the blockage break. After the clog is broken, you will begin retrieving the cable. Do so by pulling 1 to 2 feet of line out at a time. As you pull it back, continue using a clockwise motion. Reversing the direction may unwind the blockage and leave it behind to re-clog the pipe. Be sure to feed the cable back into the spool to keep any black grease on the snake from splattering onto surrounding walls. It is hard to clean up and smells horrible. After the snake is all wrapped up, you can reassemble the p-trap. If you have an older home, this is a good time to check inside the trap tubing for any signs of corrosion. If you notice any, replace the trap. A plastic trap is a suitable replacement. They are relatively inexpensive and easy to cut. If the trap is exposed a chrome-plated trap can be used for aesthetic purposes. With the trap back in place, run a fair amount of hot water. This will keep any debris you may have freed from forming a new clog. If a new clog does form a simple plunging should clear it. If not, snake it out again making sure to feed the snake further into the pipe. A motor-powered snake can be used as well. They can be expensive to buy, but most rental places and larger home improvement stores rent them. Prices vary depending on location but expect the rental cost to be between $15 to $30/per day. There are two different types of motor-powered snakes, self-feeding and manual. The manual kind works in a similar fashion as a hand snake. Pulling down on the lever acts like the set screw and turns the cable. Always wear gloves when using models of this type as the cable can bind around the hand. A self-feeding snake is a preferable option. It is much easier to use and keeps the mess to a minimum. However, self-feeding models lack the strength of their manual counterpart. If you do decide to use a motor-powered snake, proceed slowly when you hit any blockage. Often the torque of the motor is stronger than the cable. Driving the cable too hard can cause it to break off in the pipe. If the cable binds up, pull it back a bit and use the push and pull method.